Without wanting to sound like a broken record, I have very dry skin. Whenever I'm looking for beauty or skincare products it's always my number one priority that it works for dry skin. There is nothing worse than being disappointed by a moisturiser or a foundation because it isn't hydrating enough and when it comes to skincare it's taken a lot of trial and error to find the perfect moisturisers. The first thing I notice when I have dry skin are my hands. Dry hands drive me up the wall and there's nothing worse than feeling as if your hands are like the Sahara. The hand moisturizer I just use without fail is the Body Shop Almond Hand and Nail Cream. I'm not usually a big fan of almond scented products, but this I can totally make an exception for because it isn't overpowering at all. This is the giant 100ml bottle which seriously has lasted absolute ages! They have a smaller one which would be great to stick in your handbag as well, but what I love about it is that it doesn't sit on your hands for ages so you don't feel as if you have hand cream on. Ironically, I'm also really rubbish at moisturising, more so on my body. Body moisturising is my worst enemy, I hate the feeling of being covered in moisturiser and having to spend 10 minutes flapping my arms about to let the moisturiser dry off. 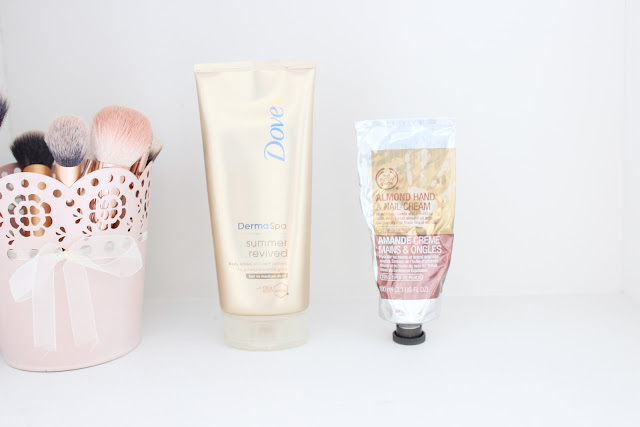 Saying that, when it comes to a tinted moisturiser, because I know I'm going to receive a nice glowing tan from it, I'm far more willing to use it everyday! I came back from my trip to Zurich with a very mild tan and I did not want it to fade. 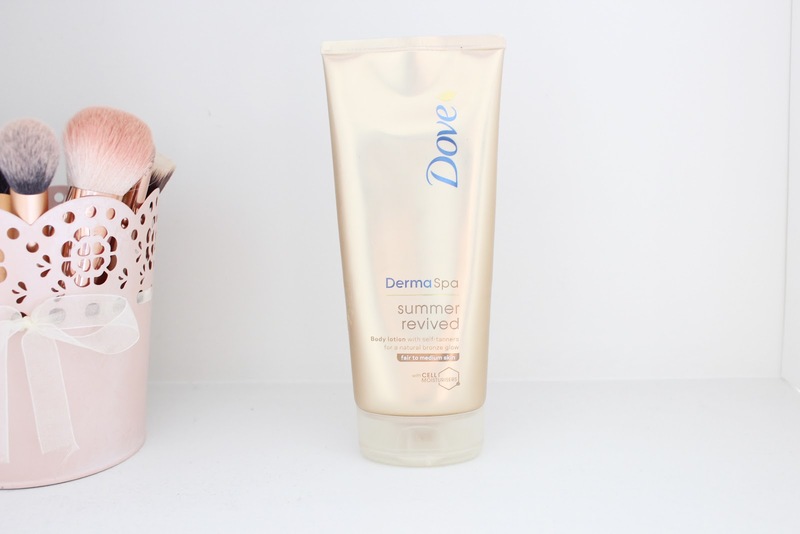 To ensure that, I purchased the The Dove 'Derma Spa' Summer Revived Tinted Moisturizer. This stuff is absolutely incredible. I applied this right after getting out of the shower, and it soaked right in (whoop no flapping about for 10 mins). After three days (only applying it once a day) I had such a beautiful glow! This isn't sparkly at all and just leaves you with such a great looking tan - even better, it's not streaky! I even got this on offer and think I only paid £3.50 for it in Superdrug which was a real bargain! Although you do get that faint fake tan scent, it's not really pungent and it doesn't linger on your skin for that long. It scrubs off easily and I've also noticed that it doesn't stain. Even better, my skin had never felt better in those 3 days - tan and moisturizing? Yes please. 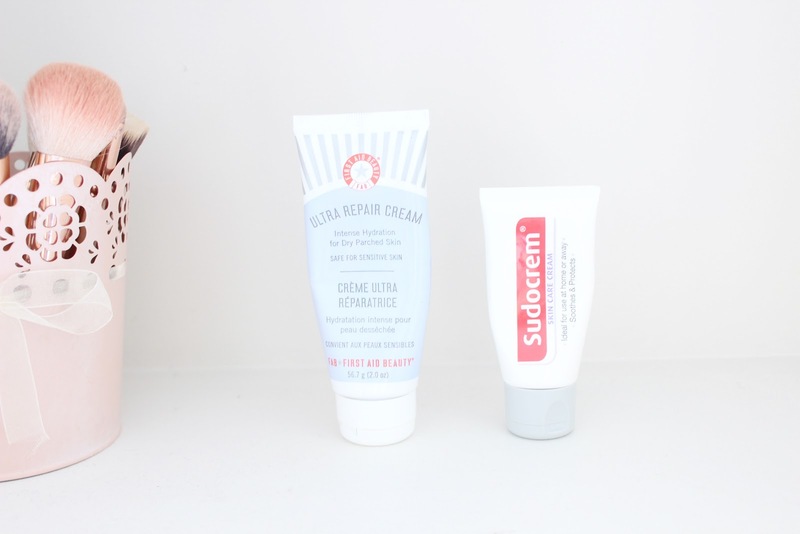 I've raved on and on and on about the First Aid Beauty Ultra Repair Cream on the blog so I really won't harp on anymore about it than necessary. I was someone who would always have that crusty/flakey skin under-neath my foundation and it never looked smooth at all how cute am I? Dry skin girls, seriously, you need to look no further than First Aid. I was so so surprised with how amazing this is. I don't have anymore dry/red skin around my nose at all. It's also really great for people with sensitive skin, and it doesn't cause breakouts either (at least for me) even though it is a heavy moisturiser. I've heard great things about the rest of their range, but if there is one thing to try I guarantee it's this - such a game changer! Sudocrem* will probably be known to you as that product that as a baby your parents pretty much relied on to clear up anything. Bumps, bruises, nappy rash, chicken pox scarring etc etc, guaranteed it was used. However, I experienced a horrific heat rash whilst I was on holiday this year and you would not believe the difference this made. Apparently a load of celebs swear by it, Cheryl Cole claiming it's her break out savior, but for me, it was the perfect soothing moisturizer/care cream to finally get rid of my face rash. Basically I couldn't wear foundation at all because of how cakey and weirdly textured my face looked, but this got rid of the rash in 3 days. Beware though, it's not a moisturiser to put on underneath a foundation, you can definitely see the whiteness of the cream, so save it for night time! I would seriously recommend it to anyone whose got severe sunburn or rashes as a heavy duty moisturizer! Let me know what your moisturising saviors are in the comments below and which ones you can't live without! 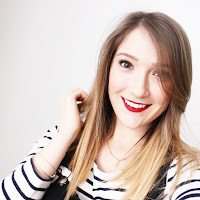 The Dove Gradual Tan has been a long term favourite of mine since my school days. I love it! I love The Body Shop one too! Can't beat a good bit of sudocrem on a nasty under the skin spot - lovely post! I can tell that the hand cream a well loved product! I also don't always like the scent of almond but I definitely want to give that hand cream a go! !